You may have heard the term AREDs pop up when it comes to senior care. 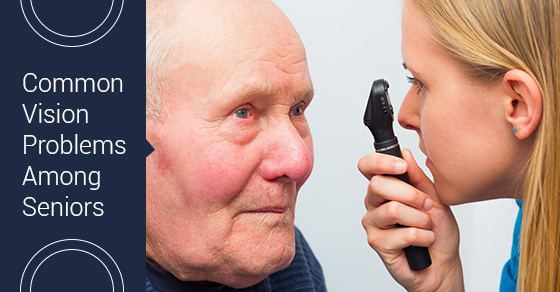 AREDs stands for age-related eye diseases and there are four common ones that plague seniors. Besides the big four there are also minor ones that also cause major discomfort in ageing eyes. Glaucoma: This disease damages the eye’s optic nerve leading to vision loss and blindness. Glaucoma is symptomless at first and the vision fade does occur gradually; however, the disease can make the sufferer very uncomfortable as it progresses. There are surgeries, eye drops and other medications that can be used to treat glaucoma. If glaucoma runs in your family, there is a chance that you will have it too. Cataracts: Our lenses are made of water and protein but when this protein clumps together it can create a clouding effect. This cloudy mass that blankets parts of the lense is called a cataract. This disease creates fuzzy vision, double vision and makes the affected eye extremely sensitive to light. Surgery is the only way to correct the vision loss cataracts cause. Women are more susceptible to cataracts than men and if you come from a long line of people who have the disease, it is very likely that you will have it as well. Macular Degeneration: Located in the centre of the retina, the macula is the layer of tissue found at the back of the eye that is incredibly sensitive to light. Once the macula deteriorates central vision takes a hit and performing daily functions like reading or driving become very difficult. MD is common in people aged 75 and up and runs in families. Surgery and medications can be used to treat MD. Diabetic Retinopathy: Someone with diabetes may experience abnormal changes in their retina’s blood vessels. The vessels can leak and grow in places they should not, causing bleeding, breaking or hemorrhage. While this growing and bleeding is occurring, the blood vessels will try to heal themselves and detach from the retina causing diabetic retinopathy. This disease can lead to dark shadows or objects that seem to float across the vision field, blurred/distorted vision, eye pains and blindness. There is no cure for this diabetes related eye disease but surgery and laser treatment can help alleviate some of the pain and vision loss if caught early. Minor AREDs like dry eyes, presbyopia (the inability to see small print and objects), blocked tear ducts, conjunctivitis (pink-eye), eyelid issues (drooping eyelids, blinking spasms, inflamed outer lids) and even arthritis within the eye socket/joints can also plague elder eyes.